In an age when we make heroes out of musicians who have ceased to be dependent on drugs, it is rare to encounter one whose life is profoundly inspiring. The late pianist, Sofia Cosma (1914-2011) has been such a personal inspiration to me, that I had to do what I could to tell her story on film. The music on this CD is from concert performances, radio broadcasts, and studio recordings from 1959 to 1990. 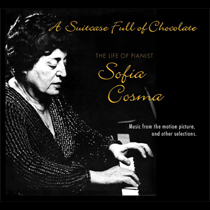 Sofia Cosma was a great Russian pianist of strong emotional output and authority.